Spend the Holidays on board Adriana III. We are pleased to announce the return of ADRIANA III to the charter market! 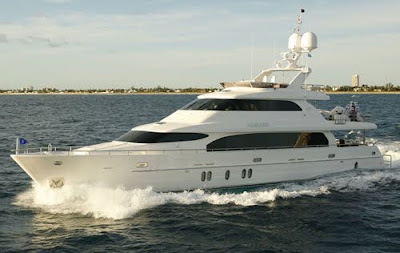 With an unbelievable rate of $42,500 per week, plus expenses for all bookings through January 31, 2011. ADRIANA III can accommodate 8 guests in 4 cabins. The Master cabin is located below deck, mid-ship with a king size bed, His and Hers bathroom with tub, shower and head. The VIP cabin is located forward with a king-size bed, shower and head. The Port Guest cabin has convertible twin beds, shower and head. The Starboard Guest cabin has a double bed, shower and head. ADRIANA III is fully air conditioned through out.